At the turn of the seventeenth century, the Leiden professor Everard Vorstius (1565–1624) acquired a curious dried crab from the Moluccas. Vorstius knew just whom to show it to: his admired colleague and the authority on natural history in Leiden at the time, Carolus Clusius (1526–1609). Clusius came to visit Vorstius at some point in 1603 to study the dried animal and included the new species in his book Exoticorum libri decem (1605). A clear picture of the crab was added, which leaves no doubt as to which species Clusius described: a horseshoe crab, an animal living in the East Indies and the New World that was virtually unknown in Europe at the time. Vorstius and Clusius must have been excited to see, touch, and investigate the horseshoe crab – a species they saw for the very first time. The anecdote also illuminates the importance of the culture of collecting in the field of natural history, as well as the importance of good images. Sixteenth- and seventeenth-century Europe had a lively collecting culture. 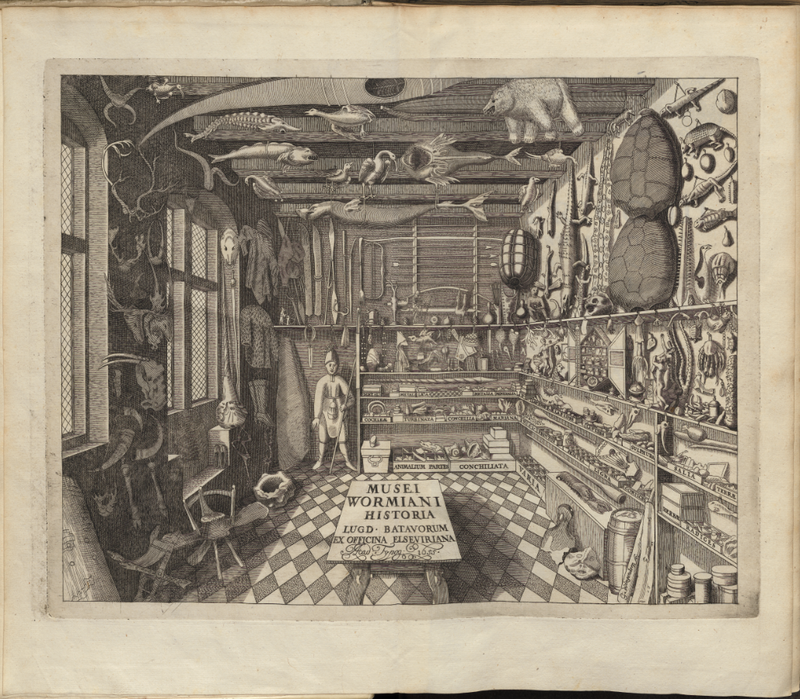 Princes and professors, apothecaries and artists, merchants and physicians: different groups of people became obsessed with collecting. They filled their cabinets (or Kunst- und Wunderkammern) with man-made and natural objects: artificialia and naturalia. Various aquatic naturalia belonged to the most fashionable collectables: think of horseshoe crabs, blowfish, sawfish, narwhal tusks, and corals and shells. Particularly fashionable were objects from the East- and West-Indies, which reached Europe on an unprecedented scale as a result of the rise of trading companies. In first instance, collectors were mainly interested in the most curious, rare, or exotic naturalia, but in the course of the seventeenth century, and especially in the eighteenth century, the emphasis shifted towards a greater attention for ‘typical’ or local nature. At the same time, the interest in and need for classification grew. While Clusius seems to have thought he was the first to publish an image of the horseshoe crab, another picture of the animal had been printed over a decade earlier. In 1590, Theodor de Bry (1528–1598) published the first volume of his best-selling America series in Frankfurt am Main. 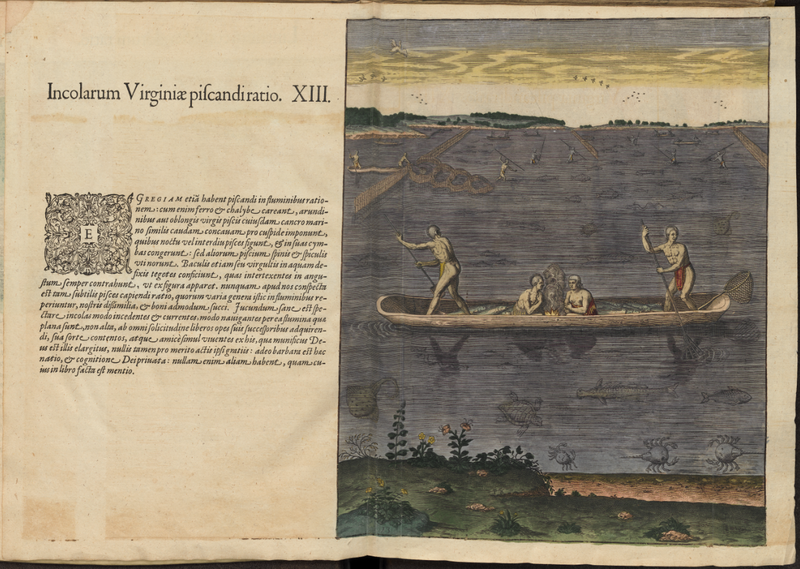 This first volume includes an engraving of native people fishing, with a variety of aquatic animals, including two schematic horseshoe crabs. 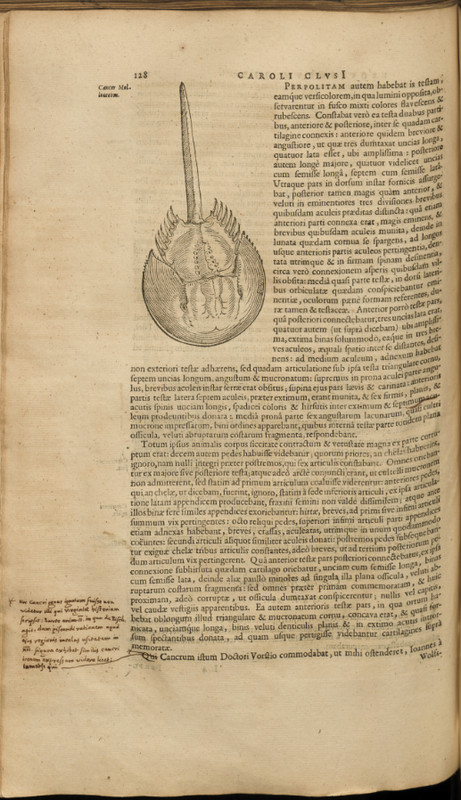 Another image of a horseshoe crab occurs on the title page of Ole Worm’s (1588–1655) Museum Wormianum. This Danish collector acquired large numbers of aquatic naturalia. The horseshoe crab is depicted on the right-side wall amidst the saw of sawfish, some dried fish, a crab, a squid, two small turtles, and two large turtle shells. In the early modern period, all these animals belonged to the broad category of ‘fish’, which basically referred to the whole aquatic fauna. The engraver Nicolaes de Bruyn (1571–1656) had a similarly broad notion of the category ‘fish’. With the publication of his Libellius varia genera piscium complectens around 1594, he was probably the first to put on the market such a print series specifically devoted to fish. The pictures are clear and recognizable, which fitted the early modern turn towards nature in both the arts and sciences. Among the depicted species we find commonly known fish such as cod, sturgeon, carp, ray, haddock, garfish, herring, and sole, but also other aquatic animals such as shrimp, crabs, lobsters, water snakes, frogs and toads, and mussels and shells. De Bruyn even included some ‘fictitij pisces’ (fictitious fish) and the ‘fabulosus equus Neptuni’ (mythical horse of Neptune). Monsters and mythical creatures long remained an integral part of the fascination for the aquatic fauna. One aquatic collectable that was related to a mythical (land) creature was the narwhal tusk. Narwhal tusks were prized collectables and thought to be the horns of unicorns. In the early modern period a debate arose about the reality of the unicorn. Some suggested the horns actually came from a marine animal. Respected scholars and collectors such as the aforementioned Ole Worm were involved in this debate, which revolved around ‘proof’ from textual sources, collected objects, and images. 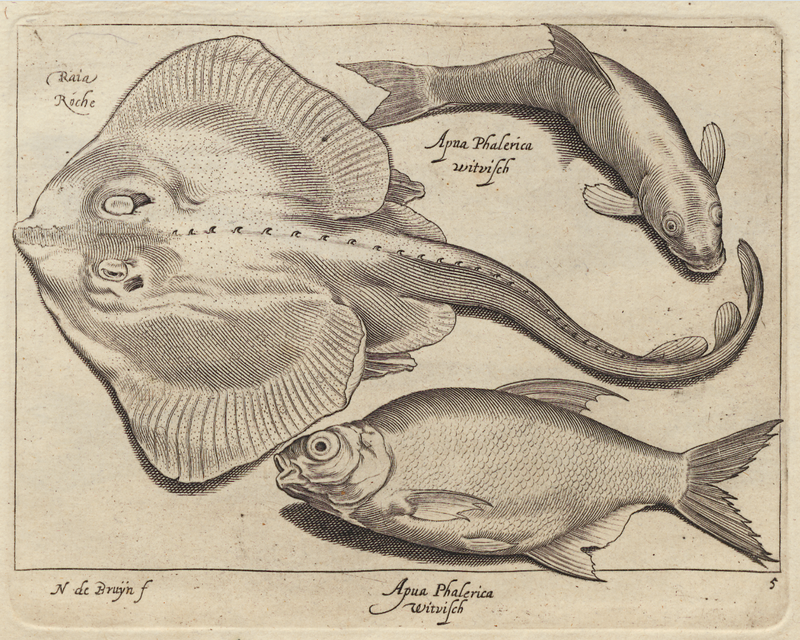 During the sixteenth and seventeenth century, artists started to depict fish in more detail and greater numbers than ever before. Whereas depictions of the Biblical stories of the miraculous draught of fish had long been popular, now engravers and painters invented new genres with detailed depictions of fish - such as specialised fish series in print (e.g. by De Bruyn), market scenes, allegories, and still lifes. Some collectors amassed beautiful albums of watercolours with images of plants and animals. These functioned as complements to the actual naturalia in their collections, or, when a particular specimen was missing, as substitute for the actual object. Images and preserved specimens both had their advantages. One could argue that preserved specimens came as close to the living ‘actual thing’ as one could imagine. But even specimens are representations that would not have existed without human intervention. A popular collectable such as a sea horse, for instance, had to be selected, captured, dried, transported, sold and bought, and then finally put on display in a cabinet. Some things were lost as a result of preservation - in the case of fish the most important thing that got lost was the original colour. Here, coloured images had an obvious advantage over preserved specimens. In the Early Modern period there were debates about the value of different types of representations. Also, some collectors were experimenting with preservation techniques or gave detailed instructions to their contacts overseas on how-to preserve their desired collectables. The most common method of preserving fish was drying. When it was relatively easy, fish were dried and kept as a whole, for instance in the case of trunkfish and blowfish. It is no coincidence that those specimens easiest to preserve, were most often found in collections. Another common preservation technique was to skin fish and dry the skin: a process very similar to the preservation of plants in a herbarium. One such method was developed and described by Johan Frederic Gronovius (1690–1762), a physician and botanist based in Leiden. The practice of preserving fish in pots and jars filled with alcohol seems to have been gradually rising during the seventeenth century. In fact, these two techniques for the preservation of fish, drying and keeping them in alcohol, remained almost unchanged for 300 years. 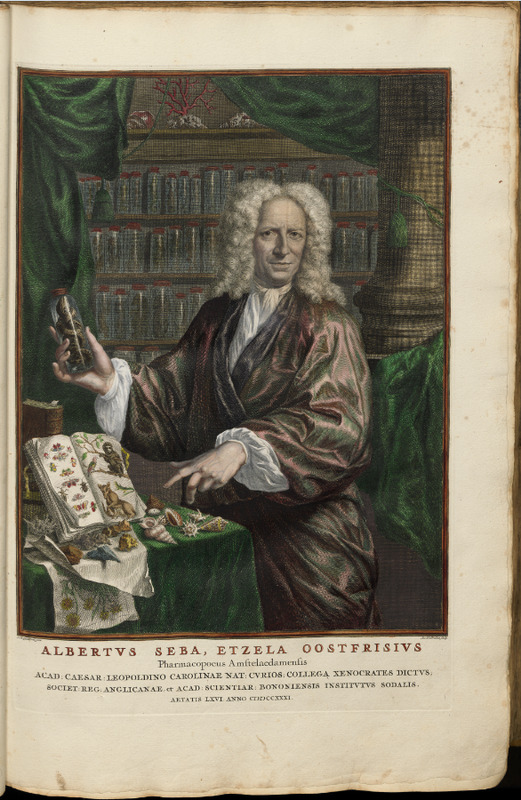 The famous collection of the apothecary Albertus Seba (1665–1736) contained both wet and dry specimens. In Seba’s portrait we see a large number of jars filled with alcohol and (unrecognizable) animals against the wall behind him. In his right hand, Seba is holding such a jar – with a snake. With his left hand, he points to some shells scattered on the table. Shells were among the most common and fashionable collectables: every self-respecting collector owned some. In Seba’s Thesaurus, the multi-volume catalogue to his collection, we find images of shells laid in decorative patterns. Curious shells with attractive forms, colours, and patterns were considered as ‘art made by nature’. But again, very practical reasons were also important in collecting trends: shells were relatively small, easy to transport, and did not need any preservation technique at all. As with all fashions, shell collecting also had its critics. 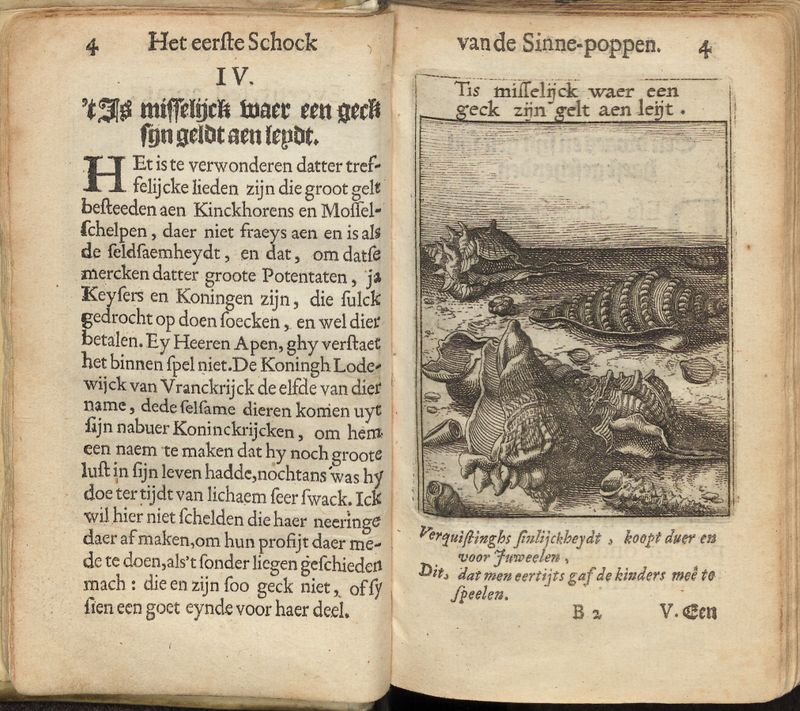 In his popular emblem book Zinne-poppen Roemer Visscher (1547–1620) ridicules the ‘geck’ (foolish) collector who spends large sums of money on shells – as if it are jewels. Collectors are ‘apen’ (monkeys), mimicking the collections of emperors and kings. However, those who are active in the shell trade are ‘soo geck niet’ (not that crazy), as they make good money. Perhaps not coincidentally, the following emblem (5) in Zinne-poppen mocks the collecting of tulips (for which incredible prices were also paid, leading to the well-known ‘Tulipmania’ in the 1630s). F. Egmond, Eye for Detail. Images of Plants and Animals in Art and Science, 1500-1630 (London: Reaktion, 2017). P. Findlen, Possessing Nature. Museums, Collecting, and Scientific Culture in Early Modern Italy (Berkeley, Los Angeles and London: University of California Press, 1994). E. Jorink, Reading the Book of Nature in the Dutch Golden Age, 1575–1715 (Leiden and Boston: Brill, 2010). A. MacGregor (ed. ), Naturalists in the Field. Collecting, Recording and Preserving the Natural World from the Fifteenth to the Twenty-First Century (Leiden and Boston: Brill, 2018). D. Margócsy, Commercial Visions. Science, Trade, and Visual Culture in the Dutch Golden Age (Chicago: University of Chicago Press, 2014). M. Rijks, ‘A Painter, a Collector, and a Horseshoe Crab. Connoisseurs of Art and Nature in Early Modern Antwerp’, Journal of the History of Collecting (forthcoming). M. Rikken, ‘Dieren verbeeld. Diervoorstellingen in tekeningen, prenten en schilderijen door kunstenaars uit de Zuidelijke Nederlanden tussen 1550 en 1630’, Ph.D. dissertation (Leiden, 2016). P.H. Smith and P. Findlen (eds. ), Merchants & Marvels: Commerce, Science and Art in Early Modern Europe (New York and London: Routledge, 2002). © Marlise Rijks and Leiden Arts in Society Blog, 2018. Unauthorised use and/or duplication of this material without express and written permission from this site’s author and/or owner is strictly prohibited. Excerpts and links may be used, provided that full and clear credit is given to Marlise Rijks and Leiden Arts in Society Blog with appropriate and specific direction to the original content.